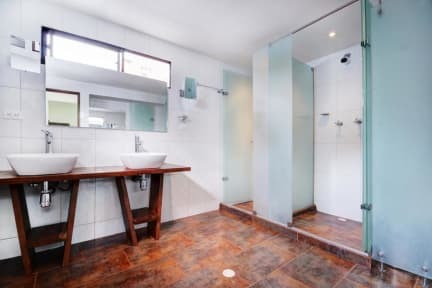 Happy Buddha Boutique Hostel i Medellin, Colombia : Boka nu! Great location, staff was superhelpful and Nice. Breakfast is probably one of the best included Ive had in a hostel! Dorms and bathrooms are clean. If you wan't to be able to sleep at night maybe stay somewhere else but if you wan't to enjoy outlife in Medellin this is definately the best hostel to stay! The hostel is really not as in the description. You can only drink from the bar there. No place to sit togheter and play games.. The 2 woman who worked at the reception are really unfriendly. The room was good & clean. Bathroom was also nice. We would not stay again there( we are not a couple & really not complicated) There are defently better&cheaper hostels in this area. Nice place if you're in Medellin only for partying a few days (many events, bar, excellent location etc.). But in the dormitories nothing works (showers, lights, no curtains, verry verry noisy) and the kitchen is dirty and almost empty so forgot about cooking.